In recognition of his exceptional contributions to the education and training of others in Middle East studies. 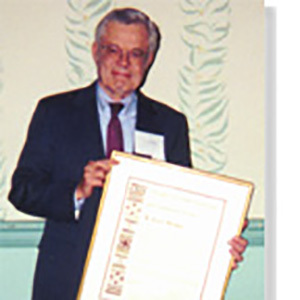 With deep appreciation for his inspiring example as a teacher and scholar, and his rare ability to communicate the profound satisfaction gained from work done well; His fine teaching through extensive preparation, meticulous organization, and effective presentation; and his careful counsel, offered to students and others with grace and enthusiasm, and his continuing attention to students’ progress in their scholarship and their careers. It is an honor to recognize L. Carl Brown, an outstanding mentor, who represents and fosters the finest of Middle East studies scholarship.